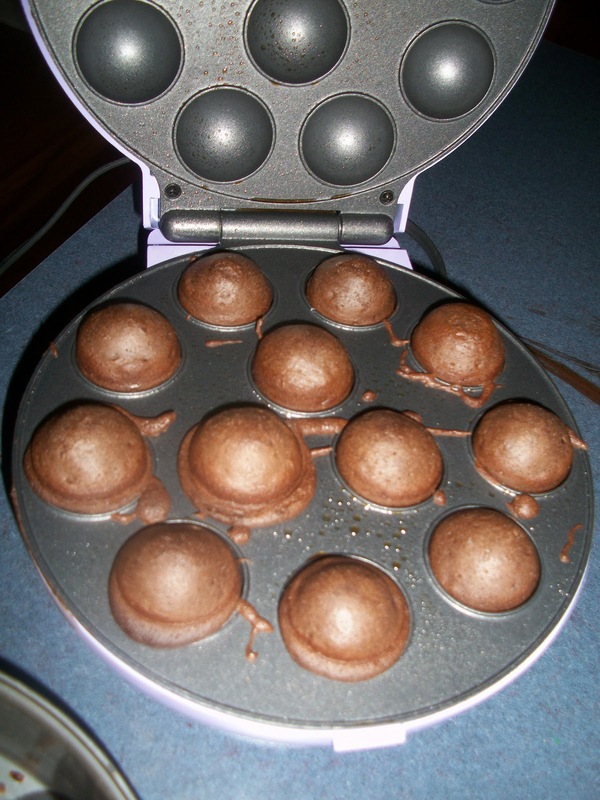 Playing with my new cake pop maker was so much fun! I didn't really make any other crafts this afternoon, because I literally could not find my hot glue gun until 5 mins ago. I finally found it in a bag of Valentine's Day crafts. Oh well, at least I found it. 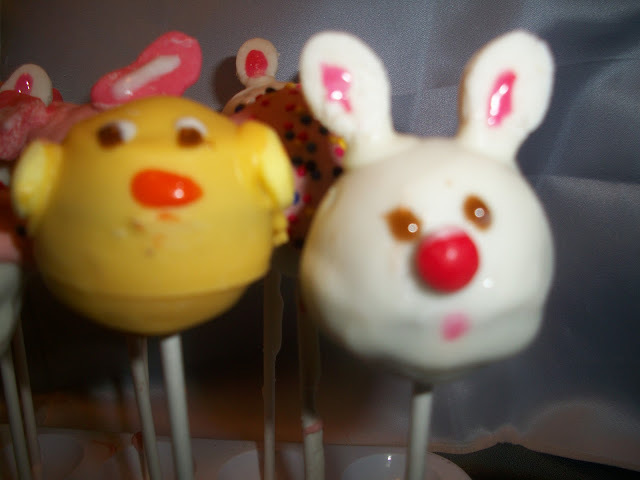 Disclosure: The links in this post are to the supplies I used to make my Easter Pops. They are affiliate links. 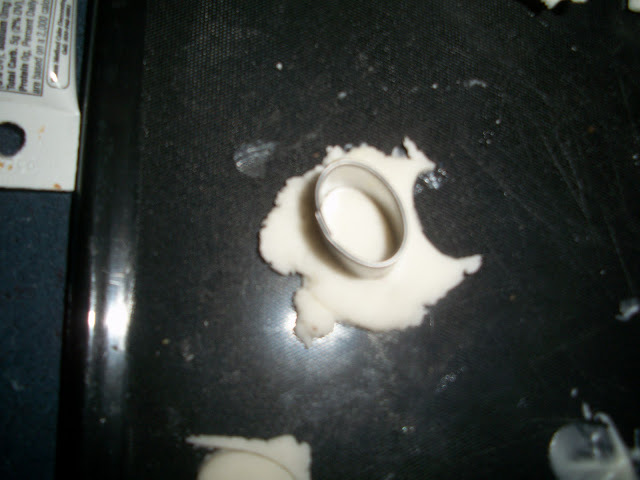 This is what the cake pop maker looks like when a cycle is done, if you are messy with the spillage like I am.. LOL! Because of the size of the cake pops, they cook very quickly. Only 4-5 mins for each cycle. 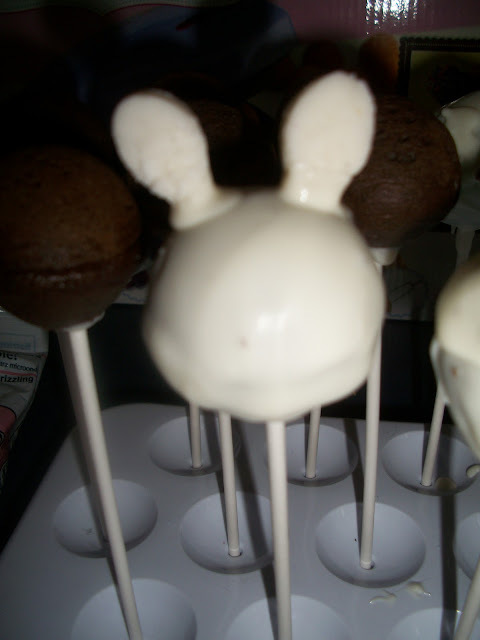 If you want to try and make cake pops and do not have a cake pop maker, there is a basic how-to recipe on E-how.com. 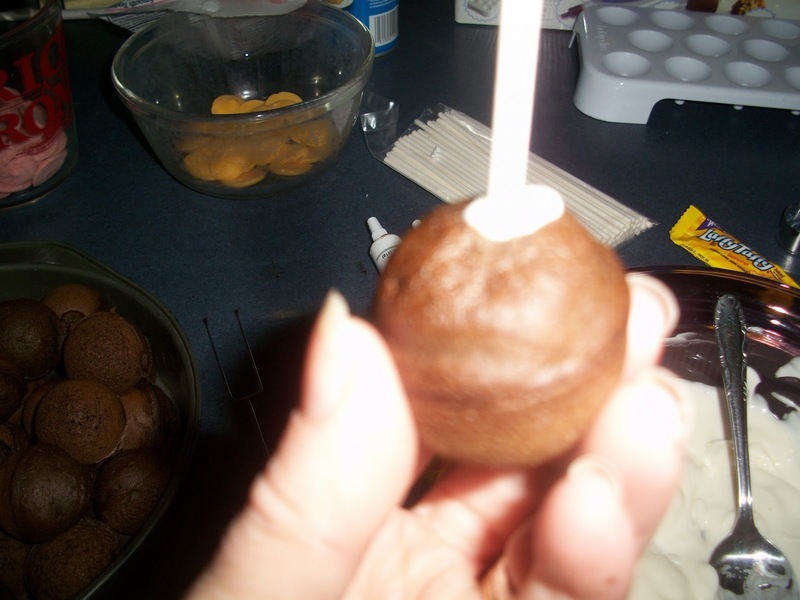 An important step when making cake pops is to add a little bit of melted chocolate to end of the stick when inserting it, and then allowing it to harden before dipping the pop. The hardened chocolate helps keep the stick in place. 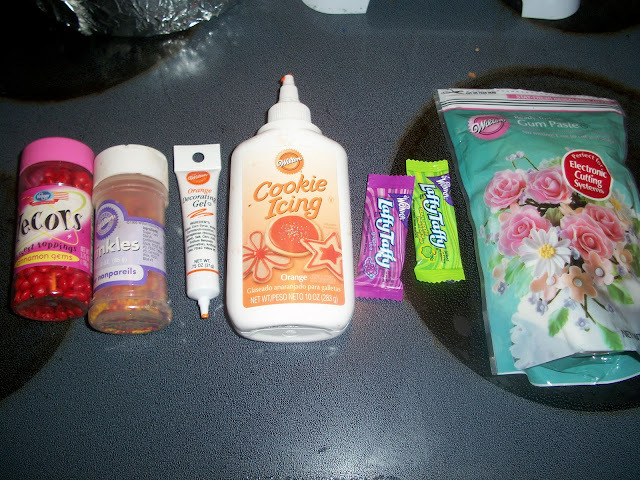 These are some of the supplies I used to make my Easter pops. Red hots, sprinkles, various gels, cookie icing, Laffy Taffy in yellow and pink, gum paste, and colored Wilton candy melts. To make the bunny, I dipped a pop in white chocolate melts, and allowed it to harden. I had a hard time finding something white to use as the ears, so I decided on gum paste. (which kind of tastes like marshmellow) I tried marshmallows, but I just could not get it to look right. 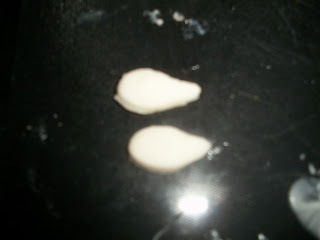 I used my mini egg shaped cookie cutter , and then shaped the gum pate into a tear drop shape. I added it to the bunny head with a little bit of melted chocolate. My bunny's face is still pretty basic because I still need to invest in edible markers. I used a red hot for the nose and gel for the eyes and mouth. To make the chick pop, I used Laffy Taffy for the wings and orange cookie icing for the beak. Place the taffy in the microwave for 5 seconds to soften it enough to make it easier to mold. Here is a version of a pink bunny. I used the pink Laffy Taffy for the ears. When I made one bunny with longer ears they kept falling down, so you might need to keep them on the shorter side. 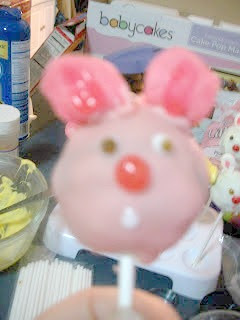 Personally even though this is meant to be a bunny, I kind of think it looks like Piglet.. I also make a few pops using two colors of chocolate and sprinkles. I thought they kind of looked like Easter Eggs even though they are more round than egg shaped. I had a little bit of chocolate left when I was finished making my pops so I decided to make one more kind of pop. 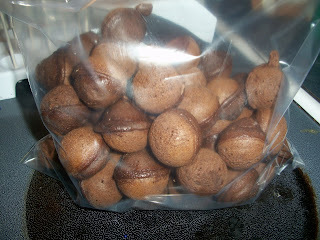 I had made brownies in my mini muffin tins a few days before. I was going to make pops out of them but they were too moist and soft. Now that 2 days have passed there some that were strong enough to hold up with warm chocolate. I dipped it in the leftover chocolate, added some sprinkles and a red M& M to look like a cherry. Yum! One cake mix makes A LOT of cake balls with the BabyCakes Cake Pop Maker. I made 18 today, and still have about 60 left. I am going to try and freeze them to use at another time. There is no way we can eat that many cake pops in a few days, no matter how good they taste. Very very cute! I just made cake pops for the 1st time for my daughter's b'day party. I was soo happy with how they turned out and how they taste! Oh how cool. 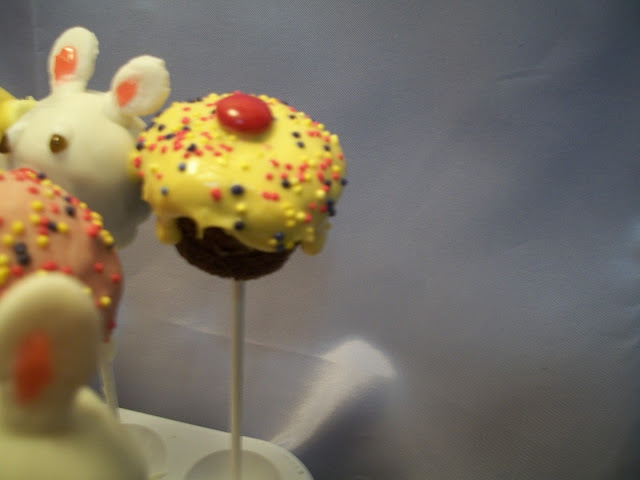 I haven't even heard of a cake pop maker, but the stuff you made looks so delicious and fun to eat. Glad I found you on the blog hop. So cute! I've never seen a cake pop maker. i need one NOW!!! Erin... They sell them at Kohls. What is great about buying them there is that there is almost always a sale and a coupon. I got mine because I was on sale and I had the 30% coupon. =) They are much cheaper at Kohls than online. Meryl. I had not heard about it until recently either. I think they are pretty new. Thank you so much for sharing this. I didn't realize they sold a pop maker....I don't bake but will share it with my niece. TFS!! Missy.. Thanks.. I just went over and posted. I am loving your blog name, that is totally me! You should see my craft room. LOL! Cute! I've never seen a cake pop maker before! Pam..question on the cake pop maker for you. Do you put cake batter into the maker and cook it? Like a cupcake? I've been toying with buying one of these. It looks so much easier. Kim..I think you will love it! Yes you put a tablespoon of cake batter in each of the cups. You then close the lid and cook it for only 4-5 mins. Super quick and easy. It took me about 30 mins to cook about 80 cake balls from one cake mix. Those are adorable! I especially love the little bunny. I've never even heard of a cake pop maker before--that's really cool! Yum! I love the little yellow chick. They all turned out cute. I'm sure our readers would love to see your idea if you'd like to link to our Show and Tell feature. Omygoodness...so cute! I've been handrolling my dang cake balls/pops. I need to get me one of those cake pop makers! Brilliant! I found you on Running With Glitter. I'm going to follow you now! saw you at the tt & Jello link up. 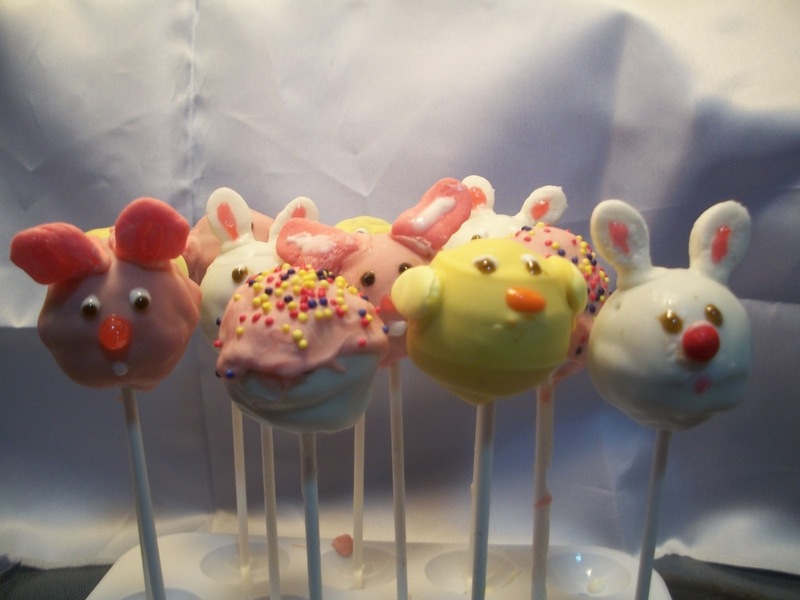 Cute cake pops. Hope you will stop by. Cake Pop maker?! What will they think up next!! These are adorable. Thanks for linking up to Foodie Friday! If you haven’t already, make sure to pop back over to enter my GIVEAWAY!!! Entries must be by Sunday evening and a winner will be picked Monday!! Very fun! I have never seen one of these cake pop makers! Looks like a lot of fun!